Esoteric Thelema: Dispelling the curse of the Dogs of Reason! Causal determinism has been with us since ancient times. It is resumed in modern times, more specifically as self-willed determinism. Unthinking acceptance of causal determinism means that Thelemic magicians become ensnared by the crapulous creed of scientism. The Law of Thelema will not be grasped by intellect alone, or by merely studying the text of the Cairo transmission. It will not be understood or practiced through appeal to the writings of ‘the Beast’, Aleister Crowley. Yet the doctrine as revealed by Aiwass, the minister of Hoor-paar-kraat, can be explained in clear and simple terms. For those so prepared, and that are willing to translate thought into action, full activation of the 93 Current is possible. There follow here four key sections abridged from ‘Lapis Philosophorum’, Lion of Truth or Esoteric Doctrine of Thelema. Superficially, the magician, sorcerer, enchanter or shapeshifter is one who changes the form, body or appearance of things. That was adequately expressed in previous definitions of magick, which were ultimately reductionist. Aleister Crowley provided a well-known example of such rationalist thought. The ‘trick’ is that all appearances, or apparitions, emerge from the latent subconscious dream. Yet nothing truly originates from the human psyche, the nature of which is reflective—as will later be demonstrated. There is a Qabalistic clue to this in the title of the 29th path of the Tree of Life, the Corporeal Intelligence. The Aramaic term for ‘body’, or ‘form’ is gosham. This word also has the meaning, ‘to incarnate’. That is, the work of the magick art, which is to incarnate spiritual ideas, through means of the signum symbol, into flesh or material form. The technical term for the operative vehicle is a talisman. This is descriptive of what a magician does. At the same time, it is descriptive of what a magician really is. A magus, especially in the ancient Persian sense of a chief of the magi, or Aeon of Aeons, is the living incarnation of a particular type of intelligence, a word in the flesh. As such, the magician is a talisman. If we are magicians, we must reappraise what magick is, else we commit error before we even begin a work. As we have learned, definitions of magick rationalise and therefore reduce the art. Magick is not comprehensible by the ordinary mode of rational thought. We can only approach magick through analogous thought. The duality: Every cause is positive or negative activity. The (phenomenal) result is cathodic. Resistance necessarily causes reaction. The analogy: A cathode is a negatively charged electrode, or conductor for electricity, by which electrons enter an electrical device. As such, the cathode may be likened to the moon (or any planet) as reflector of solar light. The human psyche is itself cathodic or reflective. It is the error of psychological or rationalist thinking to imagine that anything can originate within the human psyche. The moon is cathodic effect or (magical) result, for it embodies reflected sunlight. The signature, or individual name and character, of the reflector (cathode) determines the emanation or transmission as specific soul, spirit or body. The ancient Egyptians termed the emanation, the fire of the will-seed, as ‘fragrance’ (ISA). 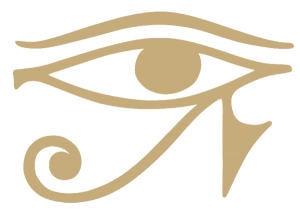 Thus Isis is the soul (or body); Osiris is the seed or germ. Isa and Asar (Isis and Osiris) are thus the earthly manifestation of the point within the circle, the magical glyph of Kether and Tiphereth. According to Liber AL, I: 49, to know the function of Isa (as circle) and Asar (as point) we must discern a difference between this manifest pair or duality and the absolute (unmanifested) duality of Nuit and Hadit, as symbolised by the same glyph. That is to say, the soul and will-seed in their individuality, as spirits, creatures, persons, are defined by name or signature. In terms of the absolute (Nuit and Hadit), the circumference (Nuit) is a container for all possibilities. The individual spirits, souls or signatures may also be termed kalas, if we adopt the Sanskrit term for a ‘moment in time’. Once defined, an emanation is subject to time. Kalas are likened to the colours of a rainbow, for while these may be numbered, they are infinite in their shades or variations. A shade is another term for a spirit, soul or body, for we are here discussing reflected light, of which the inverse effect or result is a shadow (Egyptian khaibet). Cause or activity is possible only through opposed resistance or reaction, of which one Egyptian arch-principle or Neter is the god Set. The reaction is the type of all phenomena whatsoever. The unique signature or event cannot be defined intellectually, for it cannot be described without fixing in time and space. We can only truly know and understand it through magical evocation. The analogous mode of thought, however, makes possible the apprehension of Thelema (magical will and love). The analogous mode of thought was termed by the ancient Egyptians, ‘Intelligence of the Heart’. We must understand the difference between a common symbol and a true symbol. A common symbol may be, for example, an acronym such as USA. There is no meaning in the curvature of the letter ‘U’, the serpentine form of ‘S’ or the pentagrammic ‘A’. One must know that the three letters are an abbreviation for ‘United States of America’. Unless we know that, we can never know what the acronym symbolises. Let us take, on the other hand, the figure of the Egyptian ankh. Pages, books, could be filled with explanations as to what this means. 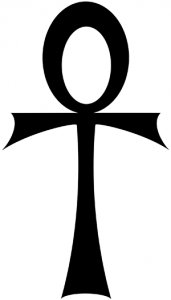 The ankh is a true symbol. If a person had no knowledge of the many meanings that can be attributed to the ankh, they could nonetheless glean, through seeking in meditation, through plumbing the depths of mind, an intuitive comprehension. The centre controls the curve; the centre is Will. Will is the rotating axis (Hadit). The equator is the centrifugal or ‘electric’ effect. Effect or result is the contraction of Will (Thelema). Yet circular current provokes magnetic, axial effect. Will is Esoteric. Effect is Exoteric. When this knowledge is translated to the physical plane, so that outcome or result is generated by manipulation of physiological function (‘sexual magick’), the verse quoted from Liber AL, I: 49 previously becomes a critical factor in the tendency produced in the (reflective) human psyche, and in any physical manifestation. Isa and Asar, or woman and man, the polar twins in time and space, must be perfectly united. As it is said, they “also are one”. Until this union takes place, they are “not of me”, that is to say, their existence is strictly limited in time. Knowing this, the soul (Isa) suffers; even while the will-seed (Asar) is poured forth in adoration of the objectified symbol, that will remains isolated. Such judgments are indeed “direful”, for even at an advanced stage of magical development there is still the very real possibility of the soul’s annihilation. The soul knows this, but the will of the ego-self has the power to contract itself, to concentrate all desire upon the objectified result, which means death for the soul. Will he not sink? Amn. Ho! warrior, if thy servant sink? The fundamental importance of the feminine love principle (not to be confused with desire per se), and indeed the magical function of the woman, the priestess in magick, was expressed but heavily veiled in the Christian Gospel narrative. It was veiled for the reason that by the time the narratives were composed, women had been excluded from the sacred mysteries, which had been placed under the sole governance of patriarchs. In this sense, those who follow Aleister Crowley’s incomplete understanding of sexual magic are bound to the outcomes of a black science on the one hand (viz., rational materialism), and a black art. By ‘black’ we mean blind, ignorant or dumb—without a word. The black art includes magical practices that either exclude women altogether, or that require them to be passively compliant vessels for the masculine will. 1. The complete ‘Lapis Philosophorum’ treatise, with annotations, is set forth in Babalon Unveiled! Thelemic Monographs. 2. Magick by Aleister Crowley [various publishers and editions]. 3. This section is an expansion of the ideas of R. A. Schwaller de Lubicz as expressed in Symbol and the Symbolic (1951, Cairo). The Mysterium Symbol of Esoteric Thelema is explained here.